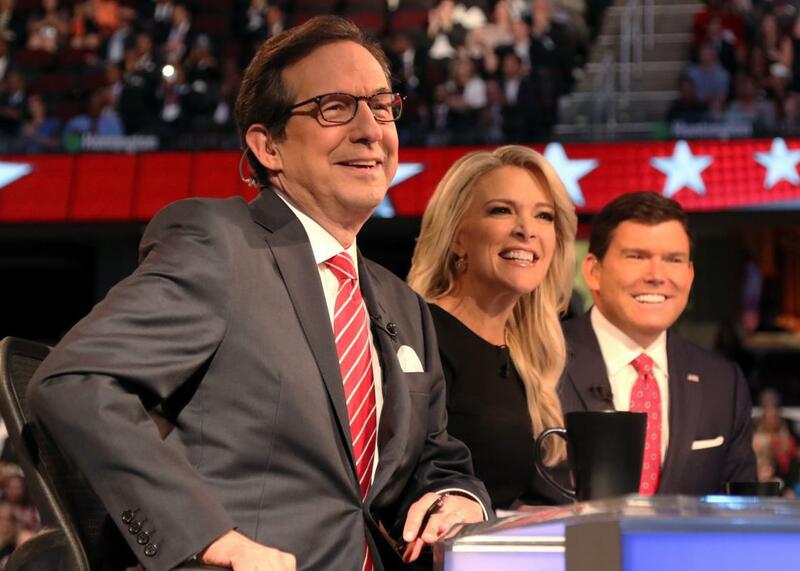 Fox News GOP debate: Brett Baier, Megyn Kelly, and Chris Wallace got the job done. The Fox News Debate Was Classic Fox News. It Was Also Great. They’re smiling for good reason. Fox News moderators Chris Wallace, Megyn Kelly, and Brett Baier at the start the Republican presidential debate in Cleveland on August 6, 2015. Thursday night’s GOP debate was a Fox News affair from beginning to end. Brett Baier opened by asking the candidates onstage to pledge their fealty to the Republican Party. Megyn Kelly ended it by asking them a question about God that morphed into one about God and veterans. You can’t get much more Fox News than that. Despite that—or actually, because of it—the prime-time event was a complete and total success: Fox News being Fox News and also Fox News at its best. And when the Fox News trio couldn’t lead the candidates into the ring with one another, they put on the gloves themselves. They grilled Scott Walker and Marco Rubio on their inconsistent immigration views. They pressed Ben Carson on foreign policy and his general political inexperience, Mike Huckabee on Social Security, and Ted Cruz on his divisiveness. And they went after Ohio hometown hero John Kasich on his decision to accept Obamacare’s Medicaid expansion and his opposition to gay marriage. Things didn’t get any easier for The Donald from there. Kelly ticked off some of the horrible things Trump has called women—“fat pigs,” “dogs,” “slobs,” and “disgusting animals”—and then asked him whether “that sounds to you like the temperament of a man we should elect as president.” Wallace pressed Trump to finally provide the evidence he says he has that the Mexican government is intentionally sending criminals to the United States (“Why not use this first Republican presidential debate to share your proof with the American people?”), and Baier zeroed in on Trump’s previous support of a single-payer health care system (“Why were you for that then and why aren’t you for it now?”). The typical post-debate analysis is unkind to the moderators, often because the moderators do not do a good job. But tonight the Fox News crew did the opposite: They hosted a rigorous and fun debate that made the GOP nominating contest finally look like a fair fight.